e-Learning Acupuncture: Re-thinking assignment late penalties in distance courses? Is it time to think outside the box or not? Re-thinking assignment late penalties in distance courses? Is it time to think outside the box or not? David Truss recently posted a fantastic commentary on a blog post by Tom Schimmer entitled: Enough with the Late Penalties. The subject is about late penalties in school. Essentially the argument they both make is that if you examine the objectives of most courses, rarely is there an objective that relates to punctuality or ability to meet deadlines. If this is the case then why do the large majority of courses issue marks (i.e. 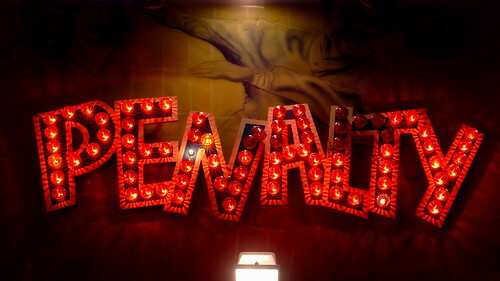 penalties!) to students based on when they hand in their work? It's a fantastic argument that I feel is very thought provoking. Most assignments are formative assessments and in order for them to have a chance to function as such they need to be submitted and graded prior to the student beginning work on subsequent assignments. Removing late penalties and theoretically allowing students to hand in their material anytime during the course may circumvent the benefits of the formative assessment-feedback cycle. Cheating. Students that hand their assignments in ‘early’ and receive their feedback can share the feedback with other students who have not yet submitted their work. For assignments that have specific answers (unlike large essay assignments) this opens a large potential avenue for cheating. Some people may argue that the instructor could simply delay giving feedback on this assignment until all submissions have been received but I think that’s equally dangerous. Students these days want prompt feedback – not delayed feedback. How about instructor marking? As an instructor I can be more efficient, objective and consistent if I mark all related assignments in the same condensed timeframe (preferably on the same day). By allowing students to hand in their material anytime, then the instructor will be marking the same assignments on various days and consistency may falter. Are there more reasons that I have missed? While I like the noble idea of not penalizing students for the date at which they submit their assignments if the course objectives do not address aspects related to punctuality, etc., I think the three reasons I have presented above are important enough that I would not want to ignore them. What do you think about late penalties? Should they be abolished or not? Why? Is the only possible penalty 'marks'? Leave a comment below. I have been a university faculty member for 20 plus year but, in addition, I am currently in a distance learning graduate degree program expanding my education. As a student, I actually appreciate having an assignment deadline. Otherwise it would be extremely easy to let things slide later and later in the course rather than spacing them out over time. This is especially easy to do in a distance course where there is not even a defined class time at which one has to be in attendance. Weekly requirements (quizzes, discussion board postings) with associated deadlines also help in motivating me to keep up with the assignments. For example, some of the courses that I've taken have a weekly quiz to do online. If you don't take it by the deadline, the quiz shuts off and you're out of luck. But the quiz is available all week and we know from the beginning of the course that the week's quiz has to be finished by Wed. at 11 PM Pacific time (for example). This assures that the entire class is generally on track. Without such constraints to keep people working at about the same pace, the discussion boards become more and more disorganized with people discussing a much broader range of topics. The ones who are behind are not able to participate in the current discussion boards, get even further behind and then flounder. I should note that the people in these classes are extremely motivated and successful in other respects. Virtually every one in my courses are professionals with full time jobs and prior graduate degrees. Yet when deadlines are too fluid, it's easy to let them slide and the benefits of the learning experience slide along with it. The instructors know we are motivated and that we often have professional travel or other obligations that complicate our coursework. For major projects, I've never had an instructor penalize a late project (as long as it is in by the deadline for the end of the course grade) and as long as I give them advance notice of the reason that I needed an extension. If someone only came up with an excuse in the final minutes before the deadline, they may have been less forgiving. Overall, I am not opposed to reasonable flexibility but I think the unique aspects of distance learning may make late penalties even more important than in more traditional contexts. This is a very thoughful comment and your perspective as a student in a distance gaduate programme is well communicated. I too feel that the deadlines help keep the class at a group-pace and that that provides structure and collective progress to the learning over the semester. Thanks! Great post with excellent points! 1. "...Removing late penalties and theoretically allowing students to hand in their material anytime during the course may circumvent the benefits of the formative assessment-feedback cycle." ~ Removing marks as a penalty does not mean allowing students to hand in their material anytime... or at least it shouldn't. Are marks the only way to make a kid obey a deadline? This gets very effective with later missed deadlines because it develops the 'Oh man, if I don't get this in on time my teacher is going to make it really hard for me' kind of attitude. As an aside Students these days don't just want prompt feedback – they deserve it. Prompt feedback is more effective and meaningful. 3. This isn't about allowing kids to hand in work any time. It isn't about removing deadlines. Deadlines matter! I just question the default of ‘marks off for late work’ as an effective and/or educationally sound means of providing meaningful assessment. I have not taught a distance ed course. I have not faced the challenges that offers. Still, I do wonder if 'marks off' is a necessary 'stick' to wield in order to get kids to hand in work on time? I don't think I've provided 'answers', just points to continue the discussion. Again, a great and thoughtful post! I am not sure how that challenge can be addressed. As a school based classroom teacher vs a distance ed teacher we have face contact, the ability to keep the student in and help them with their work. Is late work a big problem in distance-ed? we have students at school on occasion where even if we had penalties the work would still not be completed, or because of the penalties just not bother completing the assignments. This is part of the reason why I needed to look at alternatives to docking marks because it just was not effective.